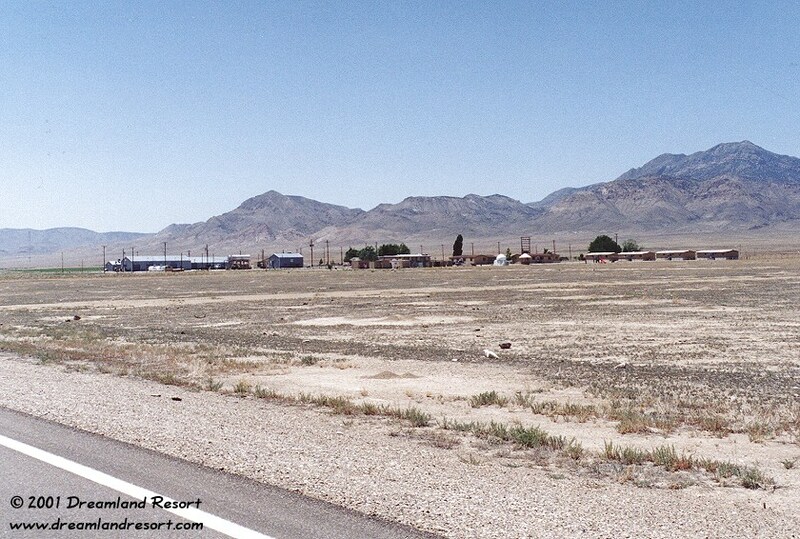 Basecamp is located about 10 miles NE of Warm Springs, on the west side of Hwy 6. It includes a housing complex, a large service area for vehicles and equipment, a fire station and some radar equipment. And of course a runway, which runs parallel to the highway, in plain sight. According to the "Special Nevada Report", September 23, 1991 below: "Base Camp is used as a staging and support area for field personnel and as a recreation area for military and contractor personnel." According to the same source it is usually manned by 3 to 6 people. A (public) dirt road, leading from Hwy 6 to the abandoned mining town Tybo in the mountains, goes right through Basecamp. It divides it into the southern maintenance area and the living quarters in the north. You can drive through and take a look around, but better stay on the road. On the other side is the end of the airstrip, which leads NE from here. There are no hangars or other buildings near the ramp, and usually no planes either. Only on one occasion we have seen one of the small Beechcraft 1900 "Janets" (N20RA) sitting parked on the ramp. 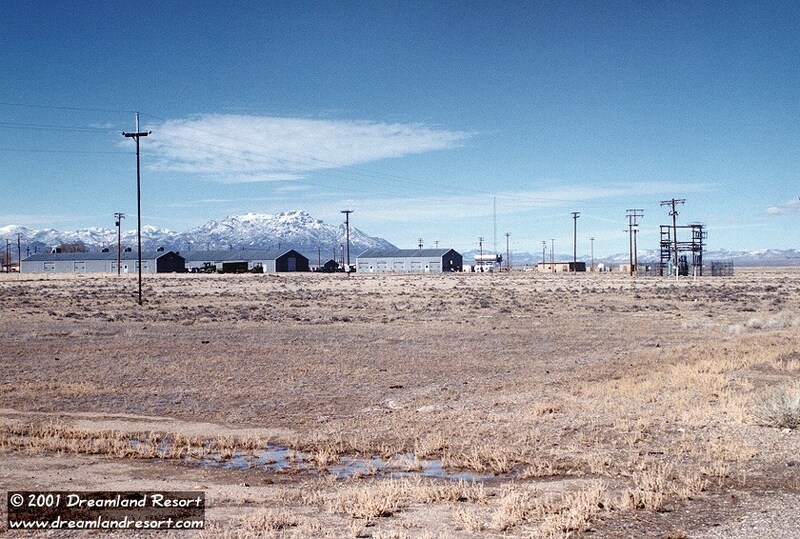 Basecamp was first built as a staging area by the Atomic Energy Commission (AEC), a predecessor of the DOE, during the underground nuclear tests in the area in the late 1960s. In particular for "Project Faultless", an underground thermonuclear detonation with 67 times the energy of the bomb dropped on Hiroshima, Japan. When the test was set off on January 19, 1968 its catastrophic results for the environment led to the immediate cancellation of any further tests. After being abandoned by the DOE, Basecamp was taken over by the Air Force, which built a modern 7300-foot runway. In fact there is evidence that Basecamp is now owned by the Air Force Flight Test Center (AFFTC) at Edwards Air Force Base. The same department that owns the Groom Lake facility. In fact there seem to be very close relations between Basecamp and Area 51. 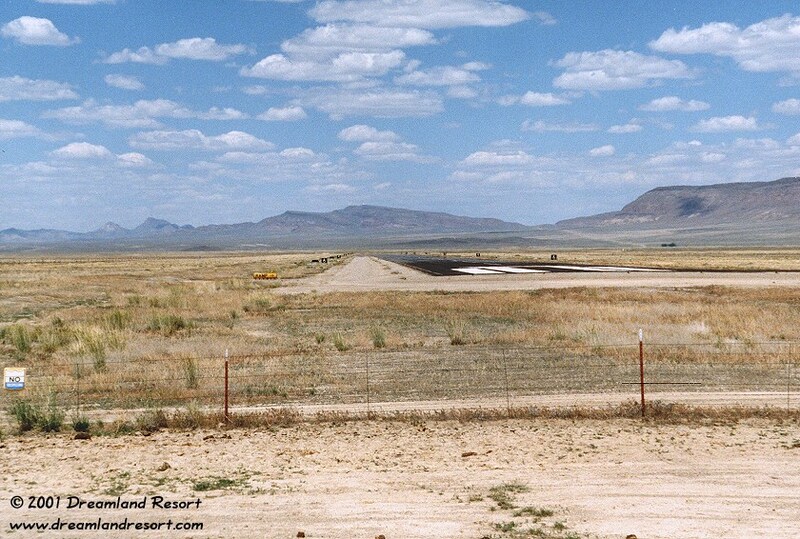 The runway was recently extended and improved, and it was used as test airfield for touch-and-go practice during the development of the F-117 Stealth Fighter at Area 51 and later at TTR. Also, Basecamp is almost in line with the north end of the runways at Groom, which makes it an ideal emergency airfield in case of problems during takeoff of a test flight. A secret facility so close to the highway, and in plain sight? It makes sense when you consider that Hwy 6 only has very light traffic, especially at night. Also, everything is very casual and low-key, and to a passing traveler the whole place looks pretty deserted. Until you turn onto the dirt road, and pull your vehicle off the road near the airstrip. Within a couple of minutes a security guard in an older model pickup truck will approach you. Unlike the Groom Lake Cammos he will actually talk to you, but of course since you are on public land he has not much legal authority at that point. Here is a typical conversation, which took place last year when I was sitting in my vehicle, on the side of the road at the end of the runway, quite visibly operating several scanners and frequency counters. Guard, pulls up next to my truck: "Sir, do you need any help?" - "No thanks, I am fine." - "What are you doing here?" - "Just sitting here." - "No really, WHAT ARE YOU DOING HERE?" - "Just sitting here." That second confirmation must have satisfied him. After a last doubtful look at my equipment he turned his truck around and drove off, back to the camp. About halfway down the runway you can see the Basecamp VOR transmitter. The VOR frequency is 113.900 MHz, and the Morse code ID is "AEC". Probably a reminder of the original use of the camp. One interesting thing is that the VOR is not always on. We stop by there regularly, and on about 50% of our visits the VOR was not active. If it is, you can clearly pick it up on your scanner while driving by on the highway. Roughly in line with the runway, a few miles away on either end are two unmanned radio facilities: A large radar dome on Halligan Mesa about 15 miles NNE and on a mountain top near Warm Springs about 11 miles SW lots of radar gear, microwave towers, satellite dishes and other antennas (see photos below). Basecamp, seen from Hwy 6. The gray buildings on the left is the maintenance area, the tan buildings on the right the living quarters. The airstrip goes out of frame to the right of the living quarters. Taken on 6/9/2001. The maintenance buildings and the main transformer station seen from the south. Taken in winter 2000. The Basecamp runway, looking NE from the dirt road to Tybo ghost town. Notice the small "No trespassing" sign on the fence. 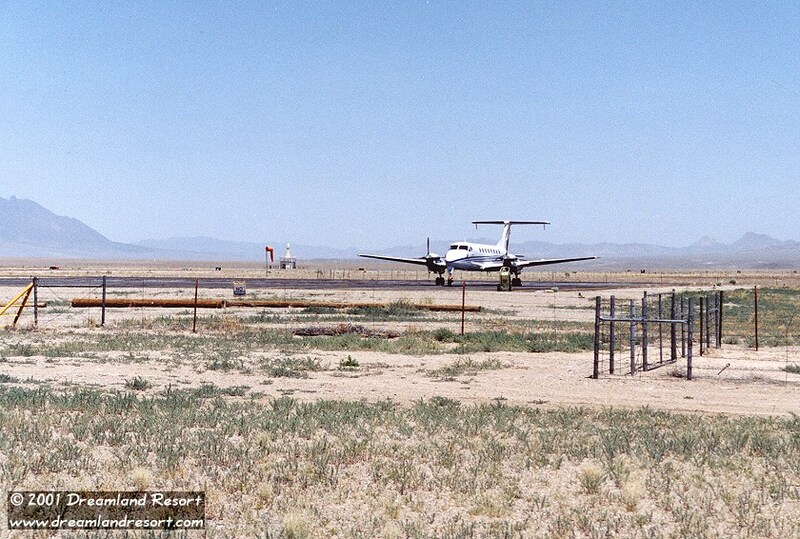 Halligan Mesa with the white radar dome on top can be seen in the background, almost in line with the runway. Taken in spring 1999. N20RA, one of the Beechcraft executive aircraft that operate from the Las Vegas Janet terminal, sitting on the Basecamp ramp. In the background is the VOR transmitter. Taken on 6/9/2001. 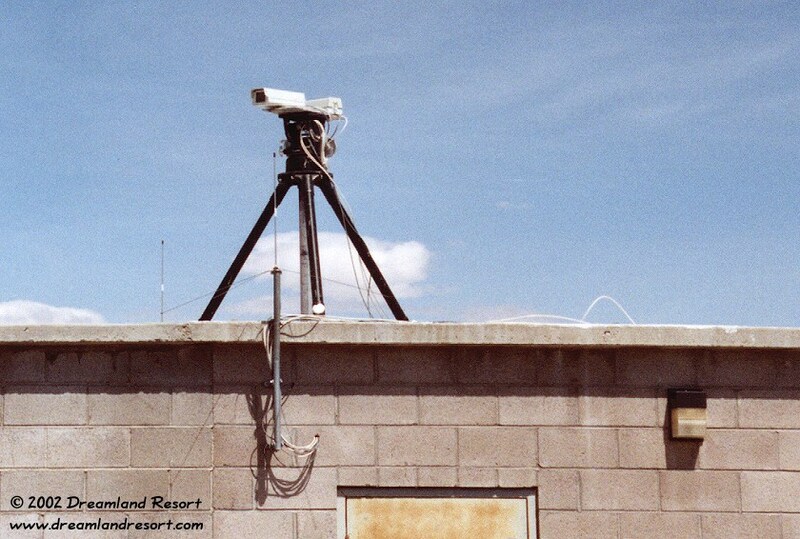 Update: On 4/8/2002 we found four new security cameras near the entrance to the Basecamp airfield. These two are mounted on top of a small building. A similar setup with two more cameras, which did not appear to be hooked up yet, was sitting on the ground next to the building. 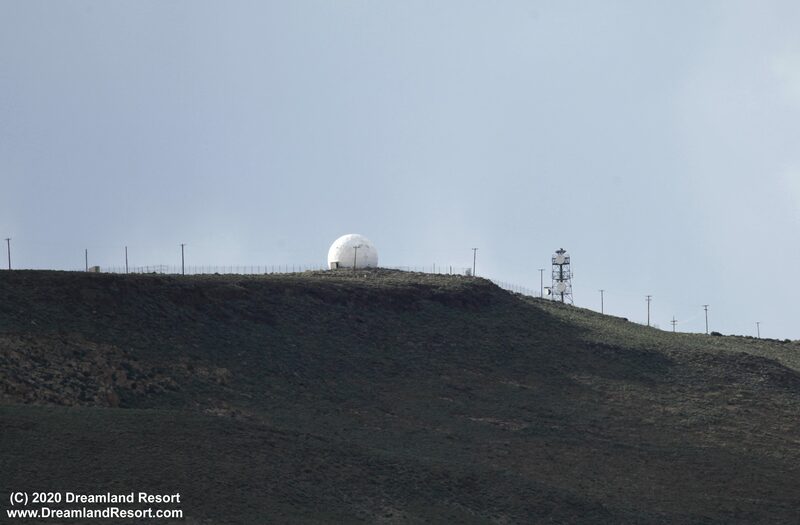 The radar dome on Halligan Mesa, about 15 miles NNE of Base Camp. The dish on the right is probably a microwave relay to the Bald Mountain radar site. Taken in spring 1999. Radio facility on a mountain top near Warm Springs, about 11 miles SW of Base Camp. Taken on 6/9/2001. Base Camp and Halligan Mesa are withdrawn by the Air Force and occupy approximately 600 acres in Hot Creek Valley in north Central Nye County. Base Camp is located 60 miles east of Tonopah on US 6. A county road passes through Base Camp land. Halligan Mesa is located approximately 15 miles northeast of Base Camp along US Highway 6 and then 3 miles northwest along a dirt road. There are no proposed changes in ownership, mission, boundaries or use of Base Camp and Halligan Mesa through the year 2000. An electronics and communications facility on Halligan Mesa, and an associated support area at Base Camp, are used for collecting data for Air Force testing programs conducted in the vicinity of the Tonopah Test Range (TTR) and the Nellis North Range. Base Camp is used as a staging and support area for field personnel and as a recreation area for military and contractor personnel. Base Camp has a recently extended and improved airstrip, several buildings for sleeping quarters, shop and maintenance buildings, and a recreation building. Base Camp is manned by three to six people. Halligan Mesa is unmanned and a helicopter pad is located near the facility.